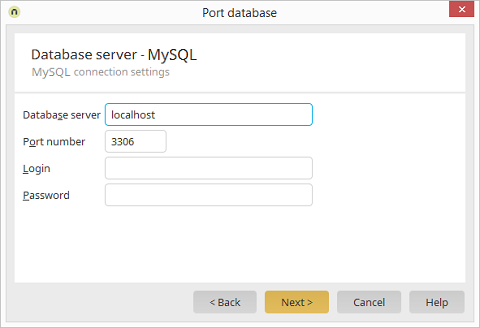 Create new portal General / Continue to Database server Database server / Select MySQL / Click on "Next"
Portal menu / Portal properties Database / Port database Database server / Select MySQL / Click on "Next"
Enter the desired server here. "localhost" can be entered for a local installation. Here, the communication port of the database has to be entered. In most cases you can keep the default settings. Enter the username of the database user. Enter the password of the selected user here.